Winter is of course the convenient season for ice fall climbing: the idea is to climb on frozen water falls using specific ice axes and crampons. Accessible starting the age of 12 years old, we would be glad to make you discover this activity on fabulous short-lived ice structures, where you will appreciate to move with delicacy, following you intuition. The season is short, generally from mid december to mid february, seize the opportunity ! Starting with “ruisseling” (easy and not too steep) to mor technical multi-pitch ice falls, wether you aim to just have fun, improve technically, or even lead climb, you won’t forget these magnificent winter days ! One ouf our mountain guides, exclusively booked by you or your group, will take your party for an unforgettable ice climbing day. 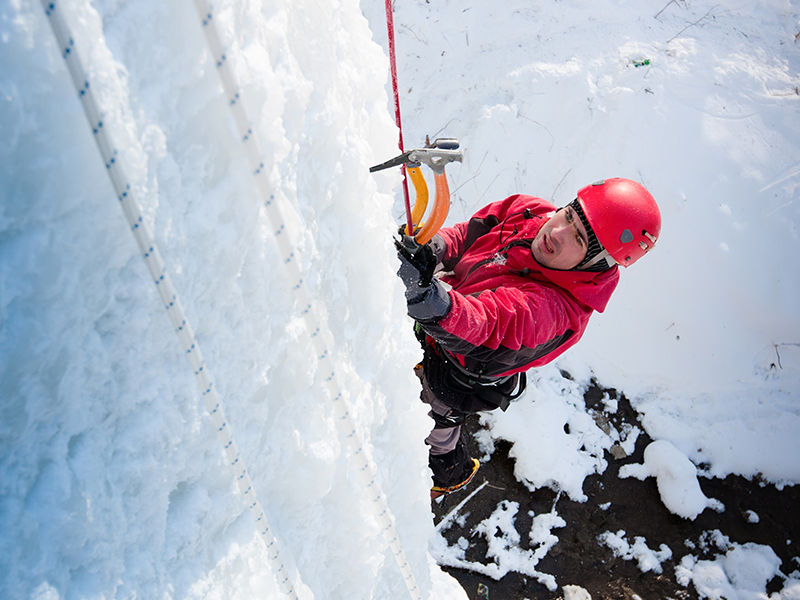 Price indicated for 1 to 4 people, for half day climbing on Champagny artificial ice tower. We limit our groups to 4 people maximum for safety reasons. Beyond a second guide will be necessary. If climbing on natural icefall (multi pitches), it’s full day : Mône, Daille, Brévières etc : 225€/pax if 2 people, 450€/pax if alone. Ice fall climbing, what is this ? It’s climbing with ice axes and crampons on frozen waterfalls. This activity, borned in 70’s, has evoluaed a lot with new equipment technologies, and new activity as “dry tooling”. Today it’s playful activity, inspired a lot by rock climbing body language. Every body can try it, from 12 years old. We have a chance in Meribel, we’re close to one of most famous artificial ice tower, situated in Champagny le Haut, ab 30mn by car from Meribel. This tower, with 22m high, propose different runs, easy to expert. You can forecast a half day for initiate yourself on ice climbing. If you enjoy it, we can propose you to climb a “true” natural ice fall with further pithces in a raw : emotions guaranteed !